Flamestone Grill located in Tampa FL just released a new menu. Modern items, keeping up with food trends (pretzel buns, salted caramel and kale salads). I was very impressed with what I experienced and suggest anyone in the bay area to visit Flamestone ASAP. 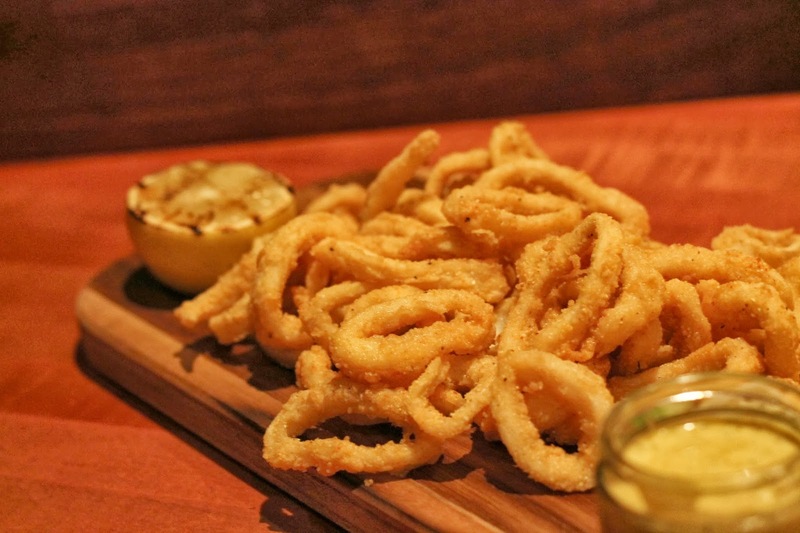 We started off with Calamari: cornmeal crusted rings of squid, served with a delecious lemon pepper cracked aioli and a grilled lemon. I could honestly eat an entire plate of this! 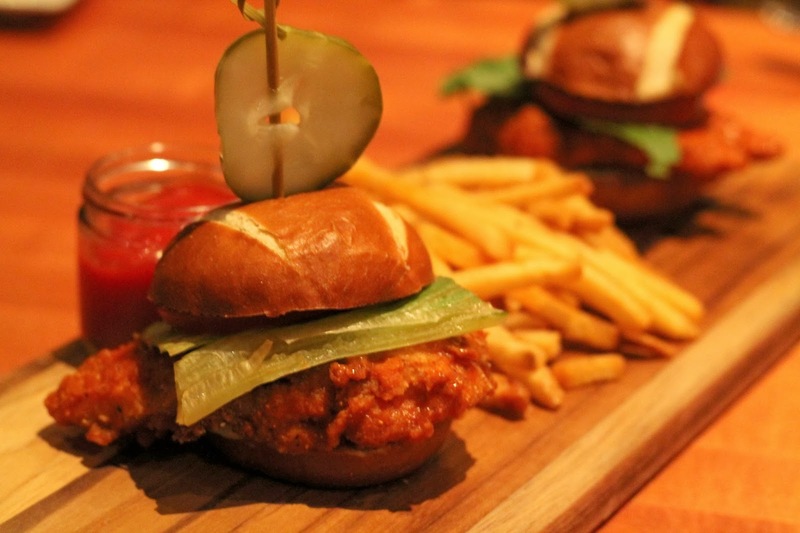 Up next was one of my favorite items of the night, Buffalo Chicken Sliders on pretzel buns - it was perfect and I could so see myself noshing on these sliders during happy hour. 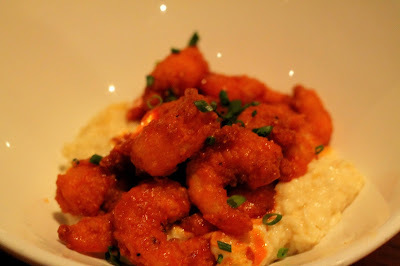 Keeping with the buffalo theme, the next item up was Shrimp N’ Grits: buffalo crispy shrimp, stone ground white cheddar grits. I am a Southern girl and those grits were legit. Too legit to grit! After the appetizers were over, we tried two new salads, Kale Salad: kale, peanuts, carrots, chopped mint, fresh cilantro vinaigrette and a Beet & Goat Cheese Salad: arugula, heirloom beets, fried goat cheese, honey-citrus vinaigrette. I loved the beet and goat cheese salad. 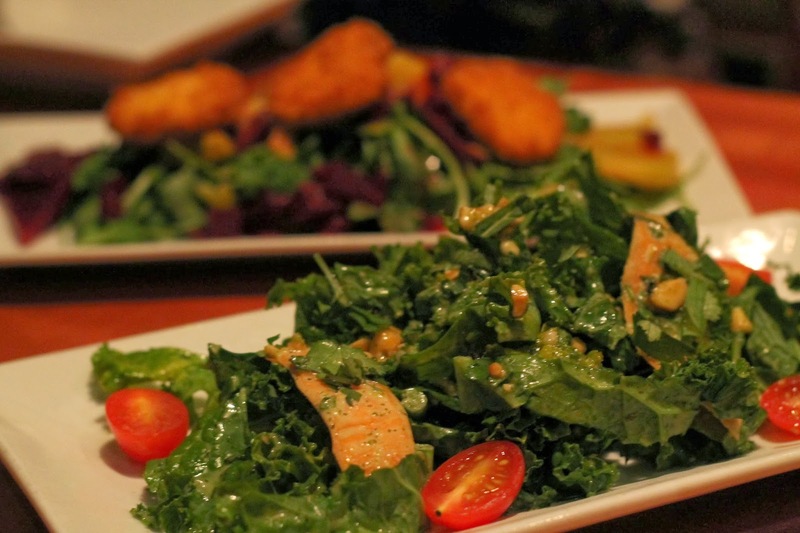 While I love kale, cilantro and mint, the Kale salad wasn't my thing. 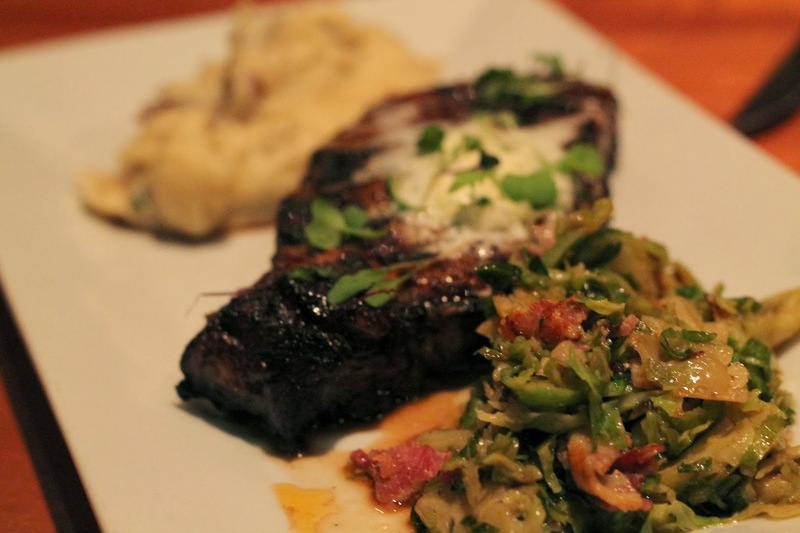 Our first entree was N.Y Strip Steak: 14oz richly marbled, served with sauteed brussells sprouts and mashed potatoes. Delicious! 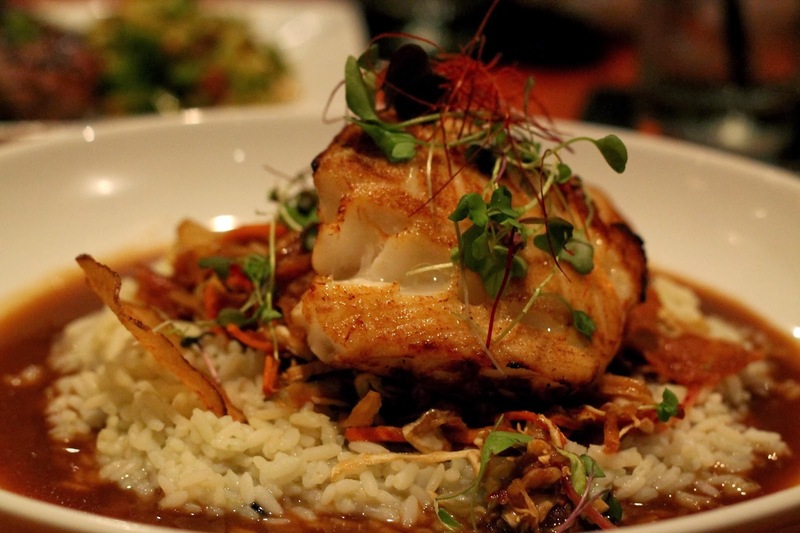 Finally, the highlight of the night - Chilean Sea Bass: yuzu marinated, miso broth, bamboo rice. I know this is weird but I am not a fan of Sea Bass....it's a texture thing. But the few bites I had were delicious. The broth, oh my - I could eat that every day. The entire table was raving over this so I know it was good. Dessert time!! Up first was an adorable Peach Cobbler served in a cast iron skillet: White chocolate macadamia nut, vanilla bean ice cream topped this delicious treat. 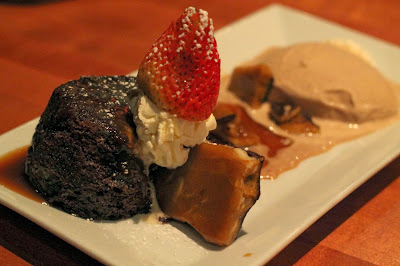 One of my favorites (and you will rarely hear me say that about a dessert) was the Sticky Toffee Pudding: homemade Nutella ice cream, salted caramel. It was perfection times a million. I want to go back for more of this right now! 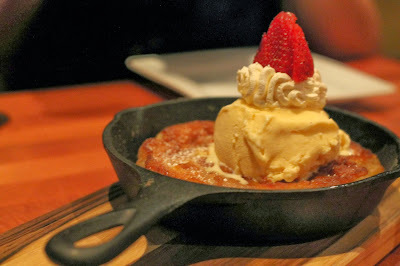 Overall, I was very impressed with Flamestone Grills new menu and say it is worth a try! What great photos, and what a fun night out! I'm so excited we got to all have this meal together. Flamestone has an A++ in my book.